Browse our products and order directly online! All orders are processed on the same day. 90% of all orders are shipped the same day. We will confirm your order by email and provide you with a tracking number and an order number for your records. Orders received through the mail should be accompanied either by a check or a money order for goods purchased. If you wish credit, send credit references so that we may establish a credit rating for your firms. Terms are Net 30 Days. 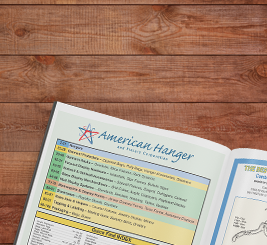 American Hanger & Fixture Corporation, 687 Lehigh Avenue, Union, NJ 07083. Place your order via email to sales@americanhanger.com. Orders are received 24 hours a day. Fax your order to (908) 687-1770. Orders are received 24 hours a day, 7 days a week. All orders for less than $50.00 are subject to a $5.00 handling fee. Save on freight by picking up your order in our NJ warehouse! We maintain a 30,000 square-foot warehouse in Union, NJ. Come down to see the products you want to purchase, gather merchandising ideas by looking at our displays and pick up your orders. Our efficient warehouse crew will be happy to load your truck or car. Our warehouse is located on 687 Lehigh Avenue, Union, NJ 07083. are open 8:30 AM – 5:00 PM Monday through Friday. To facilitate pick-ups, call your orders in early and we can have the order ready for pick-up at our warehouse entrance at 687 Lehigh Avenue. We check companies through D&B. if you are not listed in D&B, please provide 3 references and your bank for our credit manager for review. Terms are 30 days net. All orders prepaid by check or money order may be discounted 5%. Your order will be shipped upon receiving payment. Orders shipped out of NJ state or NY state are non-taxable. Orders shipped in NJ state or NY state are taxable unless a resale number is provided to us at the time the order is placed. Call as soon as possible on non-printed custom orders, and if your order has not shipped, we will cancel the order. Custom orders cannot be cancelled.